Sysessential for MBOX to NSF is one of the most sought for application because it is supportive of managing data structure while migrating emails from MBOX to NSF file format. After migration is completed, users will be able to access data as it is and that too in the same hierarchical order. This will lead to yield best results ahead. 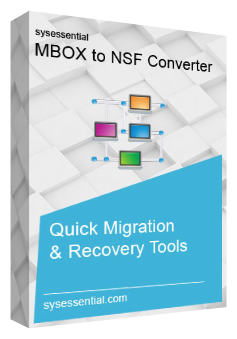 You are not forced to migrate complete data from MBOX mailbox to NSF now! Just choose the most significant data to be moved into NSF file format and leave behind least crucial data to be converted into NSF file format. Hence, selection of files is your responsibility and software will migrate only those files which you have chosen. Similar to Lotus Notes, you can run the application without thinking about the MBOX files email application. MBOX file is supportive of all in all 20 email clients (ClawsMail, AppleMail, Pocomail, Eudora, Entourage, Mulberry, , Evolution, Sylpheed, Thunderbird, OperaMail, Netscape Mozilla Mail, Cone, SeaMonkey, Mutt, and Gnu Mail etc) and if you have MBOX file created via any of them, software will start converting email data soon with disregard to any particular email app. Software is new and believes in using latest technologies rather than using old methods. It employs latest possible technologies so that hassle-free conversion can be done. By using latest technologies, application will migrate data into NSF files in quickest most way. This also saves time and energy both. One of the most useful features in Sysessential for MBOX to NSF Converter is its support for saving data into separate folder and not in the existing folder. If you want that migrated data get saved into a new folder then software can do this. Create a folder and tool will save newly created NSF files into latest build folder from you. Explain in detail regarding free of cost demonstration Run? Free of cost trial edition of Sysessential for MBOX to NSF Converter is always a recommended option. User is advised to choose this feature for checking the demonstration of MBOX files into NSF file format. You can go through the conversion process and seek the features and conversion methods used. Besides all this, free demo makes migration of first 10 emails from every folder which will clear out all the procedure used via tool. How software performs hassle-free migration? As far as hassle-free migration is concerned, software developers are experienced and trained. They know that users are time pressed these days and for solving issues of such users, they added latest possible techniques. This help in making swift data export from MBOX files into NSF format. Where to collect purchase info of the application from? After trying the application, if you are inclined for buying the tool then simply contact support team. You can chat with support executives and check out the cost of the application in different available licensed editions. This will clear out all the problems and you will be initiated with correct info. How to overcome troubles if ever occur while executing MBOX into NSF Export? Contact customer care team if you ever find any query. Just dial the helpline number anytime as team is available round the clock and solves every query with ease. Where files are stored after migration process is over? Software gives option to save converted files into separate folder. This will decrease users efforts completely as they can access the data into a separately created folder and whenever they wanted to open data, they can seek peep inside the data. Is accessibility easy after converting MBOX into NSF? Of course, data accessibility is safe and secure. You have separate folder where converted data is stored, so not to worry at all. I was using Pocomail but due to sudden expansion of my organization, I decided for using Lotus Notes email application. Now the troubling part is how to move MBOX files into NSF file format. I want some quick to perform email data converter. To my this need, my friend suggested me Sysessential for MBOX to NSF Converter. I followed his advise and today, every employee in my organization is able to access MBOX files into NSF. I can only say, it is most amazing third-party utility created till now! I was in terrible situation because I failed to successfully convert MBOX files into NSF and then I caught Sysessential for MBOX to NSF Converter in one of the internet searches. I liked the application for two biggest reasons, firstly it is the biggest online brand of today and secondly it is feature rich tool. I tried the tool and free demo clarified all the hidden features of the software. Please try it once and you will believe my words. It’s fantastic!